Born in Memphis, TN, later moving to Port Washington, WI, and a 2005 graduate of Port Washington High School, Staff Sergeant Kerry Kemp enlisted in the Marine Corps in 2007 after attending Milwaukee Area Technical College. He enjoyed playing golf and spending time with family. SSgt. Kemp attended Marine Combat Training and Military Occupations Specialty School where he became an Artillery Mechanic, MOS 2131. He was assigned to Combat Logistics Battalion 7 at Twenty-Nine Palms, CA and was a Machine Gunner for Motor Transport Company. SSgt. Kemp was meritoriously promoted to the ranks of Lance Corporal, Corporal and Sergeant during his military career. He deployed in support of both Operations Iraqi Freedom and Enduring Freedom. SSgt. Kemp joined MARSOC in September 2010, attending MARSOC Assessment & Selection Preparation and Orientation Course (ASPOC) and MARSOC Assessment & Selection Class 01-11 (A&S), as well as the Individual Training Course Class 2-11. 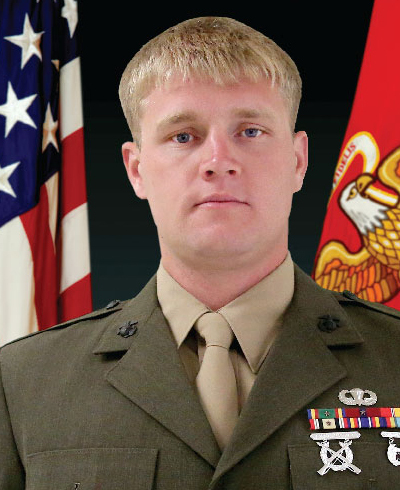 He graduated ITC in May 2012 with Class 3-11, and was assigned to 2nd Marine Special Operations Battalion. SSgt. Kemp’s personal awards include Navy-Marine Corps Achievement Medal with combat V, Combat Action Ribbon and Good Conduct Medal.